As we head into our sixth season supporting the Sydney Sixers, we want to hear from you – the Sixers’ biggest fans! NSW residents – want to WIN your very own Sixers Shirt AND 2 x Gold Tickets to the Sixers vs Renegades game on Wednesday 16th Jan at the SCG? Tell us in 25 words or less, using the hashtag #iiSupportSixers, why you should be sporting the brand new BBL08 Sixers’ gear as you cheer them on this summer. Entries close 2nd Dec. See T&C’s below for more info. 1. iiNet Limited (ABN 48 068 628 937) of 63-65 Waterloo Road Macquarie Park, Sydney NSW 2113 (“we” or “us”) are responsible for conducting the “Sixers BBL08 Season Teaser competition” (“the Competition”). 3. A copy of these Terms and Conditions can be read at http://blog.iinet.net.au/sixers-bbl08-season-teaser-competition-tcs. 4. The Competition commences at 00:01 AM AEDT on Monday 26th November 2018 and closes at 11:59 PM AEDT on Sunday 2nd December 2018 (“Competition Period”). 6. Entry is open to Australian residents in New South Wales aged 12 years or over at the date of entry. If you are under 18 years old, you need to obtain consent from your parent or guardian to enter and to provide your personal information to us. 8. 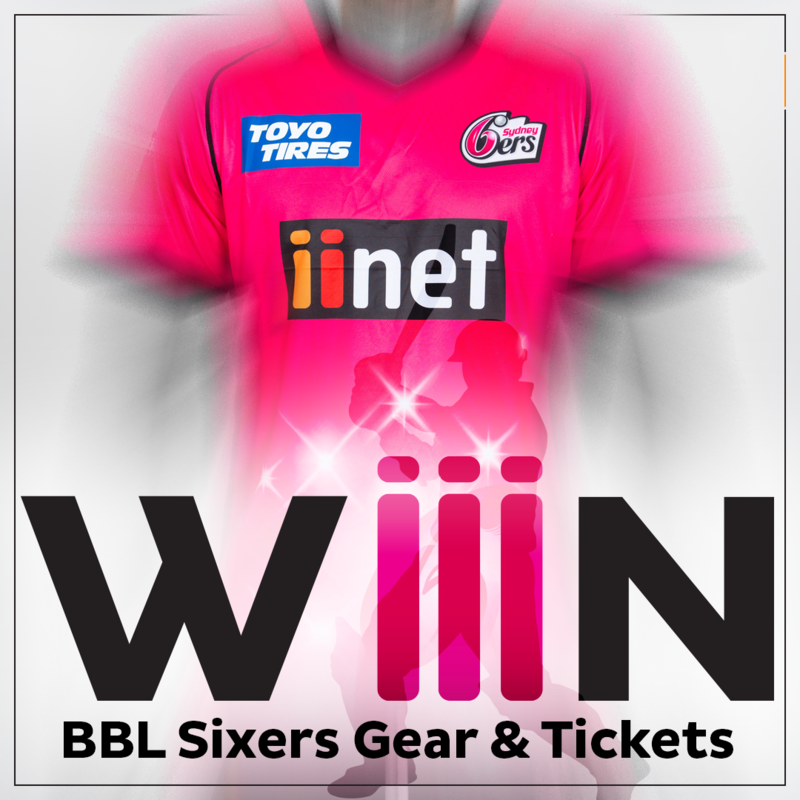 To enter the Competition you must comment on one of the official competition posts on iiNets Facebook, Twitter or Instagram page, telling us in 25 words or less and using the hashtag #iiSupportSixers, why you should be sporting the brand new BBL08 Sixers’ gear as you cheer them on (“Entry”). 9. You may enter as many times as you like. A person may only win one (1) prize. 15. The two (2) Entries determined by us to be the most original and creative from the Entries received during the Competition Period (“Winners”) will each win a Prize. 16. The Winners will be determined at Level 1, 502 Hay Street Subiaco WA 6004 on the 3rd December 2018 at 2pm AEDT. 17. The Winners will be notified on 4th December 2018. The Winners must claim their Prize by 5pm AEDT 10 December 2018 or they will forfeit the Prize and will no longer be the Winner. The Entry judged by us to be the next best Entry will become the winner (“Replacement Winner”). If the Replacement Winner does not claim their prize within 2 business days of our notification, that Replacement Winner will forfeit the Prize. 20. Each Prize consists of one (1) Sydney Sixers 2018/19 Men’s or Women’s On-field Replica Shirt and two (2) Gold Tickets to the Wednesday 16th January 2019 Sixers Versus Melbourne Renegades game at the Sydney Cricket Ground. Each Prize is valued at approximately AUD $186 (incl GST). 21. A total of two (2) Prizes are available to be won. The total value of the prize pool is approximately AUD $372 (incl GST). The Prize does not include any other costs or expenses such as accommodation or transport to and from the Sydney Cricket Ground. The Winner must make their own arrangements to attend the matches.